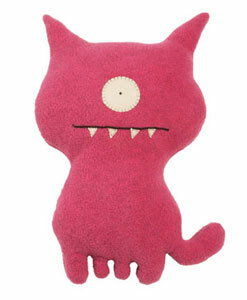 Description Of Item: From the minds of artist David Horvath and Sun-Min Kim emerge the Uglydolls! What started as a drawing of an orange creature known as Wage has turned into a whole new world of Ugliness and fun. After taking the first Wage Uglydoll along with him to his favorite hang-outs, David noticed that Wage was attracting a great deal of attention. Not wanting all of this new-found fame to go Wage's head, David and Sun-Min created a group of friends for him to share the spotlight with. Since their creation, Wage and his friends have been featured in many publications including The New York Times, The Los Angeles Times, Giant Robot Magazine, Sony Moca of Japan, Business Week, and more.